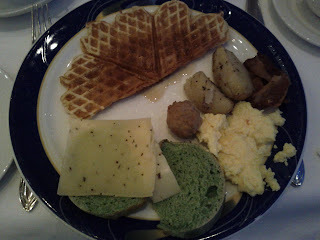 We woke up on Saturday early (jet lag) and headed down to the breakfast buffet at the Rica. This was probably the best breakfast buffet I've ever experienced - we both got at least three plates each morning we ate there. There was lots of interesting items to choose from - including many that wouldn't necessarily find their way to an American breakfast table (meatballs, cookies, deli meats, etc.). My favorite was the heart-shaped waffles! Growing up, we had a waffle iron that made these exact same waffles. My first order of business after the trip? Ordering my own heart shaped waffle iron. The green (pistachio?) bread was also really good with the fennel cheese. After a hearty 3 course breakfast, we headed out to explore Tromso. The snow was pretty deep from the last few days of snow. Our first stop was the Polar History Museum. Outside we found yet another statue of Roald Amundsen. The museum was housed in a 19th century harbor building. From the outside, it looked impossibly small, but on the inside there was a lot to see. They had a special exhibit on Amundsen's journey through the Northwest Passage along with information on seals, female polar bear hunters, polar aviation, and polar provisions. Below is a picture of Roald Amundsen in his polar exploration gear made of reindeer fur. My mom gave me a great book to read on the trip called "Reindeer People" written by anthropologist Piers Vitebsky. It was a great book and I learned a lot about both native arctic people and reindeer herding throughout time. Among other things, I learned that reindeer fur is so insulating, that when reindeer die in the arctic, their bodies ferment rather than immediately freeze. All other animals would freeze solid. Listen to more about Piers and the Reindeer People on this NPR story. The museum had a diorama demonstrating how baby seals used to be clubbed - banned since the 1970s. The temperature on our trip wasn't as cold as we anticipated. Before leaving, we had bought several Helly Hansen underlayers rated to -30 deg. Although not -30, they did come in handy when spending time outside. It turns out that Helly Hansen was an appropriate choice, as they are a Norwegian Company founded in the late 19th century to clothe Norwegians working in cold, wet environments. The polar boots below were made by Helmer Hansen - not sure if there is a relation to Helly but they were cool. So this museum was pretty small and the gift shop was even smaller. The options were limited to northern lights t-shirts, postcards, fake polar bear rugs, shot glasses, stuffed animals, and a special man-thong made of seal fur. What on earth? This was the explanation given for the seal fur item shown above. We also went to a grocery store to check out the regional items. I didn't know what to make of what appeared to be Bacon in a tube. After a few hours of walking, we settled into a late lunch at Emma's Under - one of the top two meals of the trip. It was warm and hearty and perfect for a very late lunch. I ordered fish au gratin - which was a lot like a fish pot pie combined with noodles and a crunchy crumb topping. It was great. My hubby got a salmon dish that was my favorite dish of the trip. It was beautifully cooked and served with a lemon, butter, dill sauce. It was perfect. After a late lunch, we boarded a bus which took us about 2 hours from Tromso (close to where Finland, Sweden, and Norway meet) for a little snowmobiling in the dark. I had never been on one, but it was a lot of fun. Look how warm I look - they let us borrow down jumpsuits. Aside from riding snowmobiles, the goal of the trip was to catch a glimpse of the elusive northern lights. However, heavy snow and clouds got in the way. During a brief parting of the clouds, we thought we saw something faint. I tried to take a picture. Instead of darkness - picture diaphanous green wisps in the photo below. could it be the northern lights!?!?! After coming in from the cold, we were fed reindeer and lamb stew in a large tent with a central fire. A great way to end a night full of adventure.